Finally! A single, definitive guide that tells you everything you need to know about the critical aspects of perception -- what it is and how to harness its awesome power -- when communicating during a crisis. 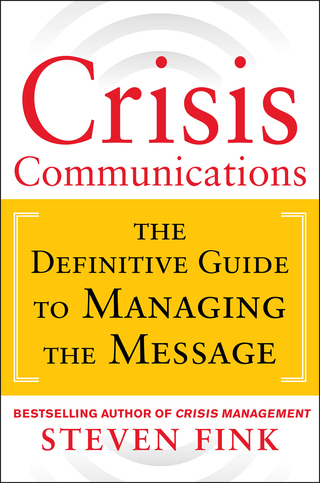 Crisis Communications, published by McGraw-Hill, is as current as today's headlines and offers no-nonsense critiques of the BP crisis, the Toyota recall debacles, the still-unfolding Penn State crisis, and many others. This book tells you -- and the companies that suffered crises -- exactly what senior management should have said and done in their respective crises. In the devastating Penn State crisis, for example, you will learn how the former and current presidents of the university, and the school's Board of Trustees, dropped the ball in their crisis communications duties, how their ineptitude in crisis communications put the school at high risk -- even jeopardizing their accreditation -- plus, what they should have said and done, and how, and why the NCAA erred in handing down the stiffest sports penalty in college history. "When facing an already difficult crisis, the last thing a company needs is to make it worse through its own communications -- or lack thereof. As one who has lived through a number of crises, I consider Steven Fink's book to be an excellent guide to avoiding collecting scar tissue of your own by learning from the scar tissue painfully collected by others." Former Chairman and CEO, Lockheed Martin Corp. The BP Oil spill, runaway Toyotas, cyanide-laced Tylenol Capsules, Three Mile Island, the financial meltdown, Exxon Valdez, Jack-in-the-Box E. coli hamburger poisonings, Enron, Bhopal – grim reminders that a crisis can strike any business at any time. But how do some companies find opportunity in a crisis, while others succumb to the dangers? Why do some succeed and others fail? Crisis Management: Planning for the Inevitable is the first book to detail the essentials of managing a crisis. Author Steven Fink, the dean of crisis management practitioners, uses actual crises drawn from sensational headlines, as well as his own extensive hands-on crisis management experience, to vividly demonstrate how to identify, isolate and manage a crisis; how to capitalize on the seemingly capricious nature of crises; and how any individual at any rung of the management ladder can strive to create achievement out of adversity. "Is Steven Fink's book one that busy executives ought to read? The answer is a resounding YES!" "In this fascinating book on economic espionage, Fink makes the case that the global threat of economic espionage is enormous and that all companies, regardless of size, need to take steps to counter this threat." "There is an old saying, 'Business is War,' and Sticky Fingers shows us just how true that is! It presents a sobering message to executives all across corporate America: Be proactive in mitigating your risks or others will be proactive in exploiting them!" HOW IMPORTANT ARE TRADE SECRETS AND HOW GREAT A THREAT IS ECONOMIC ESPIONAGE? Every business has trade secrets that need to be protected in order to survive. Whether it’s the secret formula for Coca-Cola or your list of customers, if someone gains access to your trade secrets, your competitive edge is gone, and your business may soon follow. "Economic espionage and trade secret theft threaten our nation's national security and economic well being." "Economic Espionage is the greatest threat to our national security since the Cold War." In the pitched battled between perception and reality, perception always wins, and this book more than any other tells you how to get perception on your side during a crisis. 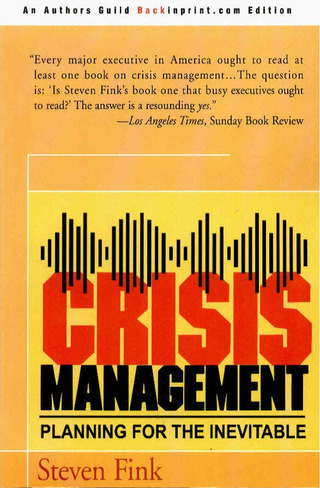 The first book ever written on crisis management, and still the gold standard in the field. The first book to pragmatically examine the cloak and dagger intrigue and business ramifications of economic espionage and trade secret theft since the passage of the landmark Economic Espionage Act of 1996. The case studies in this gripping book read like an espionage novel.